Patronage is an ability that players can receive as soon as they reach Level 4, and which becomes critically important from level 20 to end-game. Designed as a means to encourage donations of real currency, patronage is based on the lore surrounding the Twelve Great Martyrs. Each player will be chosen by one of the Martyrs, who will bless and protect him through the use of Incense and Runes. There are multiple levels of patronage. 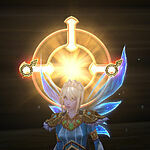 Higher levels provide increased blessing effects compared to the previous ones. 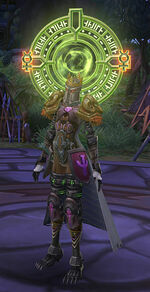 You need to obtain every lower level patronage in order to receive the quests for a higher one. Patrons gain experience every time you use one of the patron's spells (Martyr's Salvation, Martyr's Gift, Martyr's Guidance, Martyr's Protection), which will be indicated by a thin golden bar under the character's portrait. 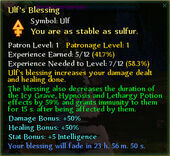 Higher Patron level will increase the effect of these spells, and the Blessing's stat bonus. Patron's maximum level is equal to the character's level. To receive their Martyr's blessing players have to use Incense. The duration of the blessing will last 1 or 21 days depending on the type of Incense. This level of patronage can be received at level 4 by completing a short quest. League quest is Power of Martyr, but Patronage can also be received in the church of Novograd. Grants the Martyr's Salvation spell. This level of patronage can be received at level 15 by completing a quest chain. 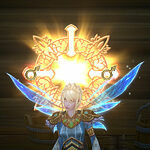 League chain starts with the Preparing for Initiation quest in Siveria. Empire chain starts in ZIT area. Grants the Martyr's Gift spell. The chain quests for this level of patronage unlock a series of training quests (such as Lesson One:Embedding Runes for League) that introduce the use of Runes. This level of patronage can be received at level 25 by completing a quest chain in Asee-Teph. League chain starts with the Contacting Your Patron quest in Central League Camp. Grants the Martyr's Guidance spell. This level of patronage can be received at level 33 by completing a quest chain in Eljune, which is available to both League and Empire and starts with the The Martyrs' Battle quest in the forest south of Itsmal Ruins. Grants the Martyr's Protection spell.